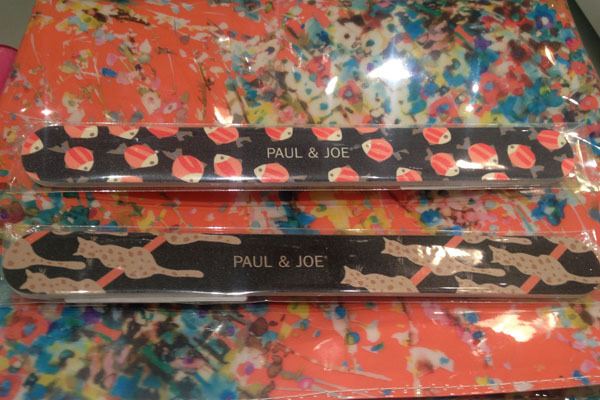 I spent a couple of days (quite literally) in Bergdorf's this past week and in addition to my usual haunt, I stopped by the Paul and Joe counter. While my restraint is performing admirably and I walked away without anything, I thought you might benefit from some guerilla swatching of part of their fairy tail-y summer collection (I left out the nail polish and shimmering body lotion). This picture does not even begin to capture the shimmer and glitter you get from a swipe of the Midsummer Nights Shimmering Pressed Powder. It's not my cup of tea, but if I liked glitter I would absolutely love this. It's by no means subtle, so I think it'll be great for nights out when you want your highlighter to truly shine. The best thing about this is the packaging is refillable with a regular pressed powder when you're done with it (and while I wasn't able to snap a photo of the packaging, Temptalia has me covered). 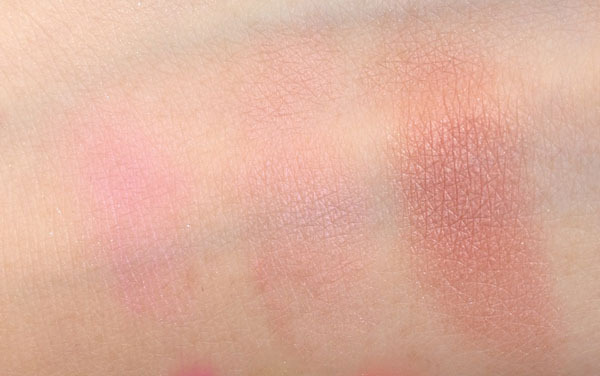 Nymph is a light cool pink, Nubile a muted peach, and Faune a shimmery brick rose. Out of the three, Faune is my favorite because it is the most pigmented and I don't think I have anything like that in my stash. 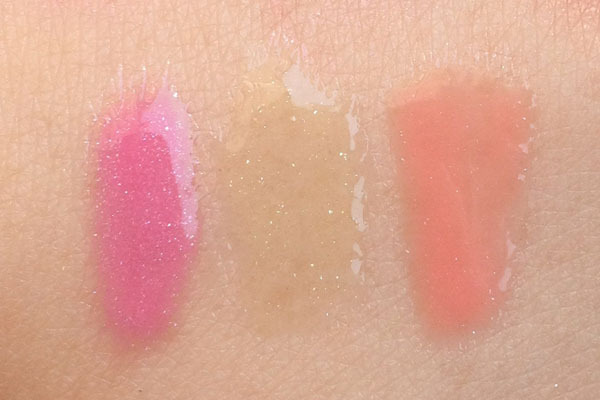 Nubile feels more like a highlighter because it's so sheer, and Nymph barely shows up at all. I had to layer it five times in the above swatch. Caroline, one of the Paul and Joe SAs in Bergdorf's, told me she liked layering the blushes over each other. 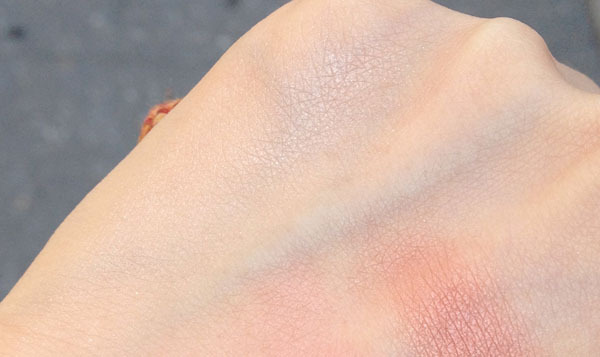 She applied Faune on my cheeks then dusted Nubile on top, which resulted in a really beautiful flush. I raised a brow when Caroline told me these lip glosses were flavored because I felt it was too cutesy for someone who was no longer 11 years old. Then Child Xiao shook her head at the Grown-Up Skeptic Xiao for not actually relishing that there are flavored lip glosses being sold at Bergdorf Goodman, and asked to try on Fairie Kisses. 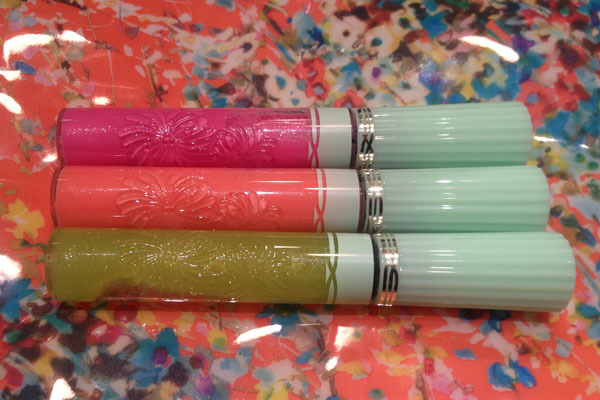 While it is lime colored in the tube, on the lips it just softens the base lip shade and adds a little sparkle. Fairie Kisses was very comfortable to wear, and tastes like (yummy) green apple. Love Potion is strawberry flavored, while Dream A Little Dream is peach. My inner child is extremely happy, thank you very much. The emory boards are not part of the summer collection. I just thought they were super cute. Cats and fishes, teehee! The patterned pouch I used as the background is a GWP, though I'm not sure how much you'll have to spend for that. The Face Color G retails for $24 each, Lip Gloss G is $22 each, and Shimmering Powder is $40. The Paul and Joe counter at Bergdorf's has two of the nicest SAs Caroline Louw and Alex Runciman, and you can reach them at 212.872.8648 or 212.872.2759. 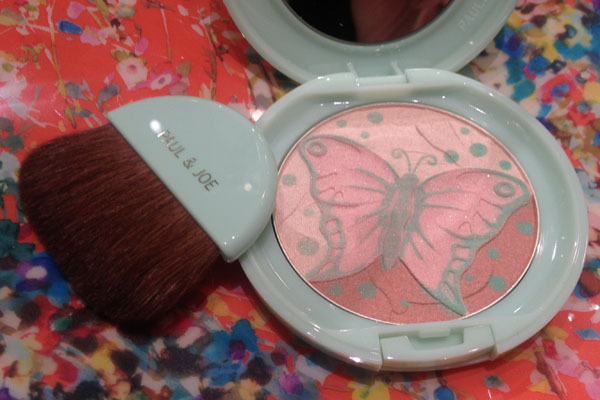 Wow too bad that highlighter powder is too glittery-it's very purdy! And Faune looks gorgeous and would make those chizeled cheekz even more chizeled! Thank you for the swatches! 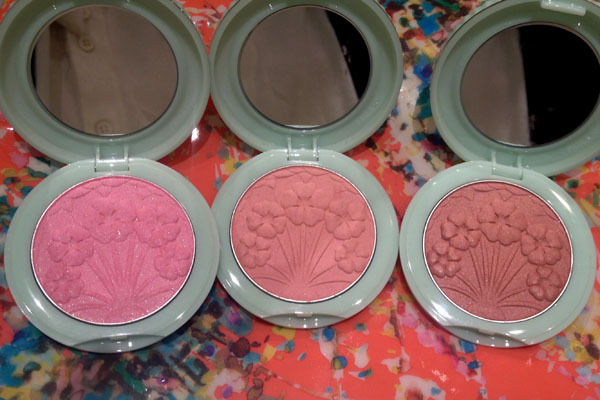 The blushes look lovely! Love Potion calls to me the most, but my experience with the last Paul & Joe products I bought was not a good one. I sold 2 of the 3 items in my blog sale. :/ The packaging is always so cute but the products didn't perform on me. I has a sad. I want that cat nail file, though I know I'll like NEVER be able to use it! PurpleRose- Fairie Kisses is the lime shade, I think you're thinking of Dream A Little Dream :) I think Nubile is best used as a highlighter, definitely too light for blush. Paris B- at your service, ma'am! Danielle- Aww :( I share your sad. They work fine on me though. The blushes actually stayed on the whole day. Was surprised! Sunny- I wanted one even though I wasn't a catlady!